Pro audio rack gear including effects, dynamics, power supplies, etc. All of our gear is refurbished, tested, and guaranteed. 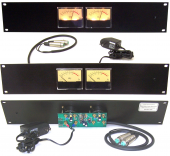 Studio Electronics rack mount lighted dual VU meter panel, with +4 balanced XLR inputs. AMS Neve Chorus Controller for DMX 15-80S, Excellent Condition, Works Great! High Voltage 265VDC, 6.3VVDC 8A Power Supply For Altec GE Westrex UA Etc Tube Gear. Top Quality Lunch Box Interface For TAB Telefunken V76 V76m V76s Preamp Modules. UREI LA-4, Recapped Cal’d Refurb'd Serviced New Opto Cells, w/XLR's. Work Great! "TWO RTS 444 -10 to +4 ""Matchbox"" units racked together EE"
Altec 1591A High gain Mic Preamp / Mixer / Compressor, Full Refurb, Works Great! 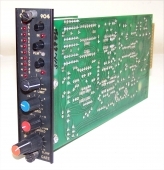 BSS DPR 402 Dual Compressor Limiter De-Esser. Fully tested, works well. BSS DPR-944 4-Chan Parametric Compresser/Gate Tested Clean Works & Sounds Great! dbx 904 Noise Gate, tested, serviced, works great, guaranteed. This is one of the last units in a limited edition run of the SE 1602, a high performance, high headroom analog summing mixer that we designed and built a few years ago. Telefunken TAB V76m SE 4-Ch rack Preamp, super quality!